Facebook has finally amidst all rumors officially launched its Messenger-enabled video chatting devices for the home, Portal and Portal+. With the launch of these devices, Facebook has entered the smart speaker space to compete with the likes of Amazon, Google, and Apple. The two products, Portal and Portal+, allows users to make and receive video calls using the Facebook Messenger service or Facebook. Portal closely resembles Amazon’s Echo Show. 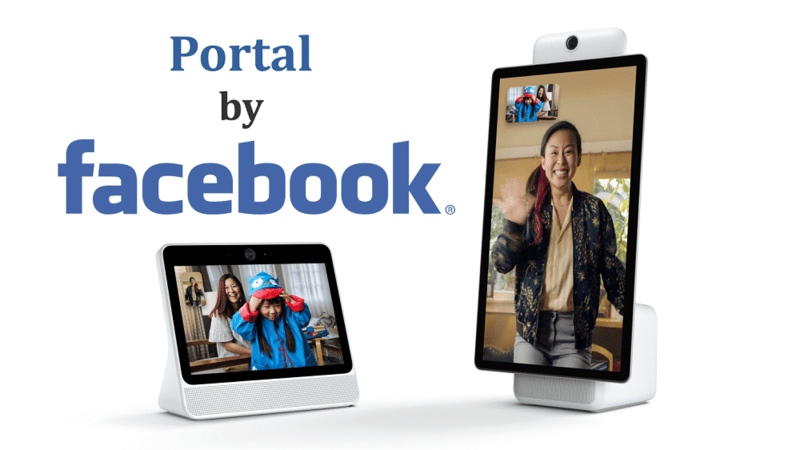 Facebook Portal features a 10-inch touch-sensitive display at a 1280 x 800 resolution, while the Portal+ has a larger high-definition 15-inch screen with a 1920 x 1080 resolution. Portal’s display is fixed in landscape mode, but Portal+’s screen can pivot between portrait and landscape modes. Smart Camera and Smart Sound use AI (artificial intelligence) technology for added security and runs locally on Portal, not on Facebook servers. Powered by AI, Portal’s Smart Camera and Smart Sound technology allow users to enjoy a more convenient, hands-free experience. While Portal’s camera doesn’t use facial recognition and doesn’t identify the user, it does follow users during video calls. “Smart Camera stays with the action and automatically pans and zooms to keep everyone in view. Smart Sound minimizes background noise and enhances the voice of whoever is talking, no matter where they move. It’s like having your own cinematographer and sound crew direct your personal video calls,” notes Facebook in a blog post. As Facebook is aware of privacy concerns, the cameras in the Portal and Portal+ come with a cover that can easily block the camera’s lens at any time and the user can still receive incoming calls and notifications, plus use voice commands. Facebook has done this to give an assurance to its users that it is not watching their moves. Also, Facebook allows users to disable cameras and the microphones in Portal and Portal+ with a single tap. Facebook notes that it “doesn’t listen to, view, or keep the contents of your Portal video calls”. The Portal conversations stay between the user and the people they are calling. In addition, video calls on the Portal are encrypted, which means the calls are always secure. Portal offers hands-free voice control. Like other voice-enabled devices, Portal only sends voice commands to Facebook servers after you say, “Hey Portal”. You can delete your Portal’s voice history in your Facebook Activity Log whenever you want. With Amazon Alexa built-in Portal, you can check for weather updates, sports scores, control smart home devices, order groceries, and much more. You can also use Amazon Prime music streaming on the device. You can call Facebook friends and connections on Messenger even if they don’t have Portal. You can also use the touchscreen to start a call. Calls can be made to and from Messenger-enabled smartphones and tablets. Portal supports group calls of up to seven people at the same time. When you are not using the video calling feature, Portal’s Superframe can display your favorite photos and videos and important notifications like birthday reminders, anniversaries to make you feel a little more connected to your closest family and friends. Another cool feature is Story Time, which has five interactive storybooks you can read. This feature brings stories to life with custom sound effects and visuals. Portal and Portal+ are available now for pre-order in the U.S. from Facebook, Amazon and Best Buy. You can purchase a Portal for $199 or a Portal+ for $349. However, if you bundle two Portal models together, you can save $100, and get the pair for just $298. Both the devices will start shipping in November.